“Champions are made in the off-season,” says 6x IRONMAN World Champion Dave Scott, and indeed it is during these crucial winter months that we lay the foundation and tone that our racing season will start on. There are the four key components to make sure are included in your winter training program. Do you have all 4? Being consistent is so important. It is better to do 6 x 45-minute trainer rides before you do 1 x 5-hour ride and nothing else all week. Think of your weekly training as a set of intervals. You rarely go out to do a threshold workout as 1-hour, all-out effort. You break it up into 10- or 20-minute intervals. Same thing here. Plan ahead and “pay it forward” a bit by saving some energy (both physical and mental) on Wednesday so you can get in another session on Thursday or Friday. It’s not the training you do this week; rather it’s what you do for this 3-4 months. Here, EK Endurance Coaching training pyramid shows you consistency is the foundation for EVERYTHING. This is not to say you have to train as long or as often as you might in spring or summer but you do need to find a manageable workload you can consistently complete. Something many people don’t realize is that if you are working at your lactate threshold or below, you are getting the same adaptations as you do from doing long slow distance (LSD) training. What’s the catch? Well of course, the harder you ride the less time you can hold that effort for. But it’s winter and you are reading this because you don’t want to spend three hours on your trainer on Tuesday morning. So the old adage of “if you only have a short amount of time go hammer!” is sort of true in this case. However, do it with purpose and structure. Our Hour Of Power cycling workout library is designed for just this. Quality training that keeps you focused (distracted) while still having fun and getting your workout in. 5- 10 minutes and you’ve done a nice hard, aerobic descending interval set that goes by quite quickly and can be done in 1 hour. I have been talking about and practicing this in my coaching since I began working with athletes over a decade ago. If you want to improve, you must discover your weak areas and bring them up to par for your goals. They don’t lie. I have seen this many times with athletes, including myself. We think we are good at something we want to be good at, when in reality, we are not. 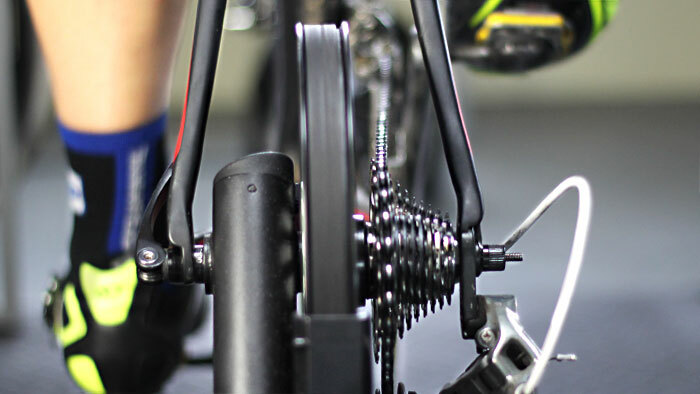 Get a power meter and do the proper field testing. This is where a coach can be critical but it doesn’t necessarily have to come from a coach. A trusted, experienced teammate or training partner can help an enormous amount. I have quoted GI Joe before in regards to training. “Knowing is half the battle”. Now it’s time for the other half. The WORK! I always say to my athletes “You have to train with what you have, not what you want to have”. Be patient, improvement won’t happen overnight—but it will happen if you keep at it. When training your weakness in the winter, break it down to its most raw element. I had a conversation with a road cyclist in the winter of 2008- 2009. I determined he had weak neuromuscular power. He had trouble with high-speed crits and repeated accelerations in races. So are we going to have him do jumps and sprints with short rest and mimic crits on the trainer doing lactic acid bath workouts? No. We are going to focus on that maximum power. Different types of short, maximal efforts with long rests. Over the course of six weeks that winter we improved his 5-second power by 14%. From 1250 to over 1400 watts. That year he upgraded to Category 1, getting good results in hilly road races, TT’s and short crits. Rest is very important—maybe the most important part of your training. Just because you are not logging 3-hour rides doesn’t mean you don’t need off days, recovery rides and stretching. Often I see more tightness and injuries in winter than in summer. Why? I feel it’s because athletes don’t take the time to cool down as much and stretch/recover properly. When their last interval is done, all they can think is, “Please get me off this thing!”. They grab some water and food and then are off to wherever. Stretch! Cool down after hard sessions! That extra five minutes now will pay you back the next time you throw your leg over the bike. Be flexible. If the weather turns nice, bag the structured trainer workout and get outside! Not feeling the mojo today? Save it for tomorrow’s session. Be dynamic and flexible this winter. Think long-term. It’s not the training you get in this week, it’s about the all the training you get in these 3-4 months. The fact is that riding the trainer can be like getting out of bed. It’s rough! But the act of starting is often the worst part. Get on, warm up, just spin, and after a few minutes images of racing, working hard for teammates and making the winning break will soon fill your head. Do this over and over again, and you will be on your way to having the best season ever. Want to learn more about winter training? Watch Eric’s webinar from last year, “Methods and Tools for Training in the Winter” where he goes into this topic in detail as well as shares specific workouts and tools for making improvements with limited time.